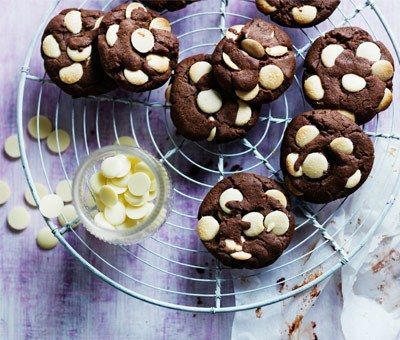 If you love our classic choc chip cookies why not try this doubly chocolaty version too! Add your favourite chocolate buttons, chips or chunks! In a large bowl, cream the butter, sugar and condensed milk until light and fluffy. Mix the flour and cocoa together then stir into the buttery mixture to form a soft dough. Roll the dough into walnut size balls then flatten them out slightly. Squish the chocolate buttons into the dough mounds and place onto the baking sheets spacing well apart as they’ll spread! Bake for 12-15 minutes. This dough will keep quite happily in the refrigerator for a week or so or you can freeze it in balls and bake to order! Really easy to make; taste fantastic! Double Choc Cookies is rated 5.0 out of 5 by 2. Rated 5 out of 5 by Bean11 from Delicious When we were looking for a cookie recipe, we happened to look at this recipe. From now on, if I was stuck on making a cookie, i would go straight to this recipe. Well done Carnation! Rated 5 out of 5 by LouB from Delicious Best double chocolate chip cookies ever! My son who has an egg allergy loves them!